All products are for professional use only. Premium Italian Hair Color available in 67 gorgeous shades. Utilizing our exclusive molecular color system and 2% or less ammonia content, Dikson Color Extra offers complete coverage, unparalleled conditioning, shine, and maximum fade resistance. The extra gentle way to achieve the lightest shades possible. Super Pastels include 5 shades plus 1 Super Lifter. Mixing ratio 1 to 2. Can be applied by brush or bottle. 45 to 55 minutes development. Each 60-ml tube provides 2 retouch applications. 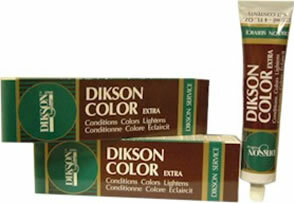 Dikson Color Premium has even more pigment than Dikson Extra Color. This gives you a new tool in creating the latest and most desirable looks. The high concentration of pigment creates a more opaque look and helps to control unwanted underlying pigment. The color you see is the color you get. Available in economical 4 oz. (120 ml.) tubes.